The Elk & Bison Prairie offers a native grassland habitat common in Kentucky more than a century ago. Elk and bison roam free within this 700-acre enclosure. Visitors travel in their enclosed vehicle via a 3.5-mile paved loop road. Numerous other wildlife species also thrive in the prairie. Wild turkeys, a variety of birds, small game, butterflies, and prairie mammals find sanctuary in the Elk & Bison Prairie. Spring is a time for new life! During March and April, we begin the process of controlled burns to protect the prairie by removing dead grasses and deterring tree growth. Elk and bison shed their winter coats. Many animals seek out rubs — trees, stumps, or rocks — to help the shedding process along. It’s prime growing season for grasses, flowers, and babies in the prairie. During the hottest days, both elk and bison seek relief by finding shade trees or taking a dip in a pond. You’ll find these large animals to be most active between sunrise and sunset. If you are visiting during summer, you might want to visit the prairie just after sunrise and right before sunset. 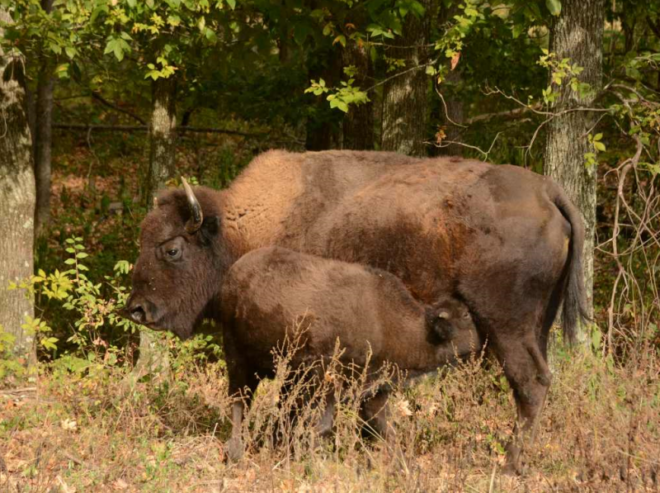 Take caution when in the presence of bison during breeding season from July to September. Bulls can be especially aggressive at this time. In early autumn you may see prairie wildflowers in bloom—purple blazing stars, partridge peas, and butterfly milkweeds. Autumn is also a busy time for prairie wildlife. 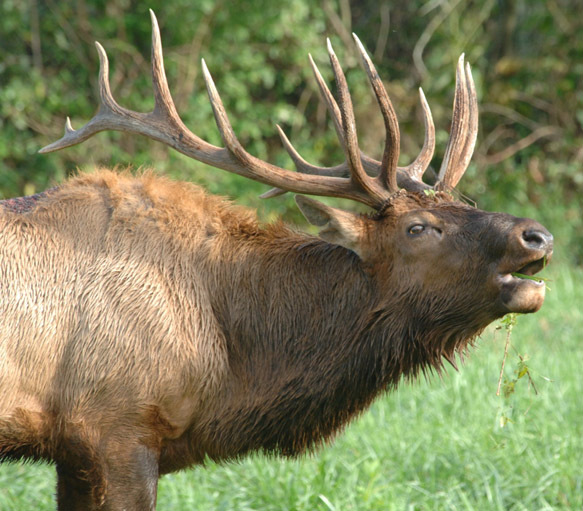 In September and October elk begin “bugling”—their mating call. Elk also rub the velvet from their antlers to prepare for mating season. Watch for trees that have been rubbed bare of bark; a sign that an animal polished its antlers. In cool weather, snakes seek out the warmth of our blacktop road. Please do not run over or harass the snakes! Reptiles are very important to the prairie ecosystem. The bare landscape of winter heightens wildlife viewing opportunities. Elk and bison will have their full winter coats by December. Elk will browse on dried grasses, twigs, bark, and mast (acorns). Bison will eat grass through the winter months and throughout the day when it’s cold. Our Bugle Corps volunteers provide interpretive assistance to visitors, and strive to ensure the safety of our visitors and wildlife. To become a Bugle Corps volunteer, call 270-924-2007. The South Bison Range sits alongside the Woodlands Trace National Scenic Byway across from The Homeplace — south of the Tennessee state line. Bison can be very dangerous during mating season and with their young calves. Stay back from the fence if bison are near; bulls have been known to charge the fence and escape. Bring binoculars for better wildlife viewing. Find more tips in our Wildlife Watching Tips. Our Elk & Bison Prairie and our South Bison Range are part of our wildlife management program.